After months of preparation, the Poetry Out Loud state championship took place March 13 in Frankfort at the Capital Plaza Hotel. The winner, Taryn Syck, of Pike County Central High School, will travel April 28-30 to Washington, D.C., for the National Poetry Out Loud Championship to represent Kentucky. While she was a tough competitor through the first two rounds, it was Syck’s third poem, “The Great Blue Heron,” by Carolyn Kizer, that put her on top. I love the moment when everything comes together: The words, the delivery and the passion. Before I became the arts education director for the Kentucky Arts Council, I was not overly impressed with the Poetry Out Loud program. I did not appreciate the value of reciting poetry written by other people. I have seen some very powerful performances at high school poetry slams. So I believed having students perform their own poetry would be much more effective. Today, I understand the value of this kind of poetry recitation. All 14 school champions were impressive. I am so glad I was not a judge. Each student in the program had been coached by one of the arts council’s teaching artists. They won their school competitions to advance to the state finals. All competitors recited two poems and then five finalists made it to the final round. Mary Hamilton, one of the teaching artists that worked with the champions, attended Thursday’s championship and later shared some of her thoughts about the day with me. “There were three specific performances today that, if they would be available for Kentucky Poetry Out Loud programs to view, would provide excellent examples of very specific performance successes,” she said. Each of these performances, as well as Taryn Syck’s recitation of the “Great Blue Heron,” will soon be available on the arts council’s website. I invite you to visit our website to view these amazing performances by high school youth. And, next year, I hope other teachers and schools across the state will give their high school students the opportunity to participate in the Poetry Out Loud program. I first became acquainted with Lexington Children’s Theatre when I was a teenager and attended the theater’s week-long Youth Theatre Arts camp at Midway College. It was there I met people who were very different from me but who I also easily related to because of our shared interest in theater and performance. I also met people who would influence my life for years to come. Let me be clear without being too personal: My involvement with theater as a young person probably saved my life. I really hated being a teenager — not because I was bullied or had problems at school or negative experiences with friends. I just did not enjoy adolescence one iota. But being involved with theater, through two summers of camps with LCT and then being invited to participate in a youth theater through an instructor I met at the camp, gave me an outlet into which I could generate my terribly frustrating teenage angst. I also made a ton of new friends, and many of them I am still in touch with to this day. All of the above to say: The arts are more important to young people than we can possibly comprehend. There are a million stories like mine, and there will continue to be children whose lives are made better through the arts as long as there are organizations like Lexington Children’s Theatre. I was very excited to conduct this interview with Larry Snipes, the theater’s producing director since 1979. I also think I should point out that it was important to Larry to recognize the entire staff of the theater and the work they do for Kentucky’s children when discussing receiving the Governor’s Awards in the Arts 2013 Education Award. Talk a little bit about the theater when you started and how things have changed over the years. When I came, it was a transition time for the theater. It was kind of a difficult time because, the children’s theater — for all of its life up until 1979 — had been a youth theater, a theater of young people performing for young people. The board had decided we were going to work more toward becoming a professional theater, and that was something I was very excited about when I came. One of the things about the Discovery shows we do now, they give young people the same performance opportunities, but they are supported by a professional staff. Our goal when I came in was to try to move the theater to a more professional company so that we could actually serve more young people. When you’re doing just the youth theater performance, you’re really focused on what those young people are getting out of the experience, not necessarily what the audience is getting out of the experience. When I came in, the idea was really to broaden that experience so the audience was getting as good of a product as we could actually provide. That was really the driving force behind what we’ve been doing the last 34 years — to do the best quality work we can possibly do, and share it with as many young people as we can. That’s kind of what pushed us into a lot of different areas. We still do the youth theater component. We do three shows a year, plus the summer family musical where we try to encourage families to do shows together — parents and young people to participate in the shows as one. We didn’t abandon that hands-on experience for a young person in performance. What we did was enhance it and try to give them the support they needed to succeed. Tell me a little more specifically about the work you do when you go into schools and the experiences the kids have and why they’re important for children in Kentucky. For a lot of young people we reach we’re the first experience they have in live performance theater. To see a full production within their school and within their community, that’s the most valuable thing we provide. We provide that final product a young person sees for the first time — where they see an actor, a live person performing before them, in the same room. It’s different from watching on television and different from watching a movie. That immediate connection they get with an artist, that’s what’s important for us. In addition to the performances we provide, we offer residencies and workshops with young people, and with teachers so they can get professional development workshops. Our education department has really come a long way the last several years in arts integration, using the arts to teach other subject matter and to integrate the arts across the curriculum. All of these things we do to try to provide a complete experience. It’s not just the performance; it’s not just the residency. It takes all of it to get there. We want to give children an opportunity to explore their creative side and to be creative. And hopefully, through this exposure and through this experience in participating in theater or seeing theater, they can look at the world a different way. They can look at themselves a different way, and they can become a more complete person by doing that. And that’s what our goal is. Why is your work important to the children and their parents, the people of Kentucky? The thing about what we do is, we tell stories. Throughout history, for as long as man has communicated, we’ve learned and told stories, and we’ve told stories to teach and help us learn. That’s the most important aspect of what we do, the storytelling. By participating in the storytelling as a performer or as an audience member — our audience members participate — it broadens your view of the world. I think that’s what we can do. We can give a young person a chance to look at what it was like to be a holocaust victim, or a king or a fairy or a princess. It gives them a chance to identify with someone in this theater, or the character or the story, and learn as that character learns. That works on every single level, whether you’re a child or someone that’s my age, or a grandparent. It works on so many levels, that experience of watching a performance or participating in a performance, or seeing something that makes you … not necessarily question, but understand something, a concept that you didn’t fully comprehend. I think that’s what storytelling has done for mankind through our history. That’s how we learn. That’s what we offer young people in Kentucky — a different way of learning, a different way of looking at things. One of the programs that the Kentucky Arts Council is most proud of are our Teaching Art Together grants, which provide assistance for Kentucky schools to bring teaching artists into their classrooms. These grants provide students with once-in-a-lifetime opportunities to experience the creative process alongside a professional artist trained in the Kentucky and national education standards. We understand! That’s why we insist that residencies complement classroom content. Residencies are a school or teacher’s chance to bring in a new voice to teach content through the arts. It’s also a way for teachers to learn new methods and techniques in these subject areas to use in the future. Take, for instance, this example from Tichenor Middle School in Erlanger. Tichenor was awarded the Teaching Art Together grant in the 2012-2013 school year. Fiber artist, Pat Sturtzel, partnered with art teacher, Scott Fairchild, to add a fiber arts component to the Tichenor Middle School art curriculum. Pat facilitated a series of fiber arts projects that built each previous activity while also reinforcing art concepts, cultural connections and math and science concepts. Over a seven-week period, Pat worked with four core classes and provided four hours of professional development to the rest of the faculty and staff. Mr. Fairchild and students learned surface design techniques (fabric dyeing, fabric printing, stitched embellishment) and textile construction techniques (construction of pillows, wall-hangings), each linked to various cultures (African, Southeast Asian, Japanese, Euro-American). The residency enhanced the arts curriculum at Tichenor by giving students the opportunity to work directly with a professional artist. This firsthand experience gave students knowledge about how a professional artist works within their chosen field. Interaction with the artist, visualizing her techniques and then being encouraged to explore their own interpretation of the creative process, enabled the students to engage in activities outside their daily instruction. Another way the residency enhanced the arts curriculum was through the introduction of a new art medium (to both the school art teacher and students). Mr. Fairchild had little experience working in this particular medium. The visiting artist worked to provide the school art teacher with an authentic experience to expand his knowledge and skills. “During the residency I was excited to see the students work and learn with Mrs. Sturtzel. 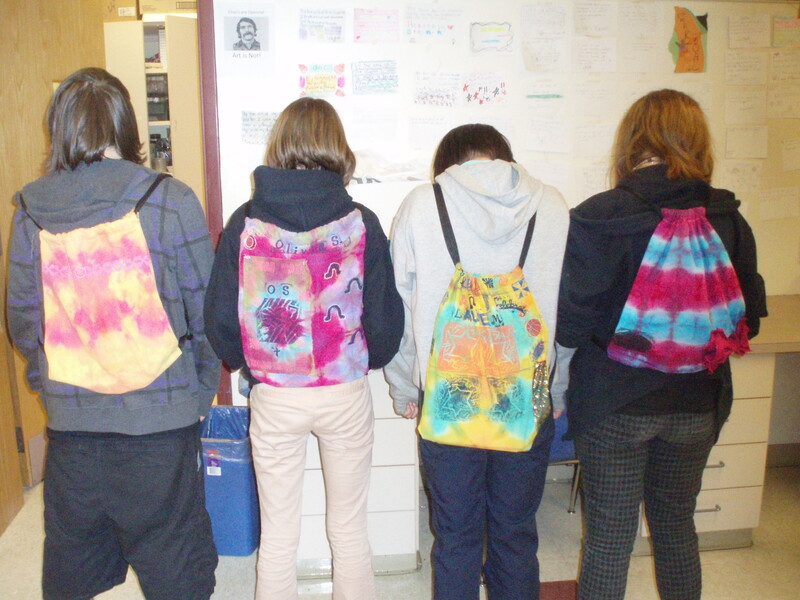 The students were up for the challenge of working in a new art process and came away with quality art projects and a basic understanding of what all goes into fiber arts.” One project the 8th grade students made were hand-dyed backpacks with a personal printed design. 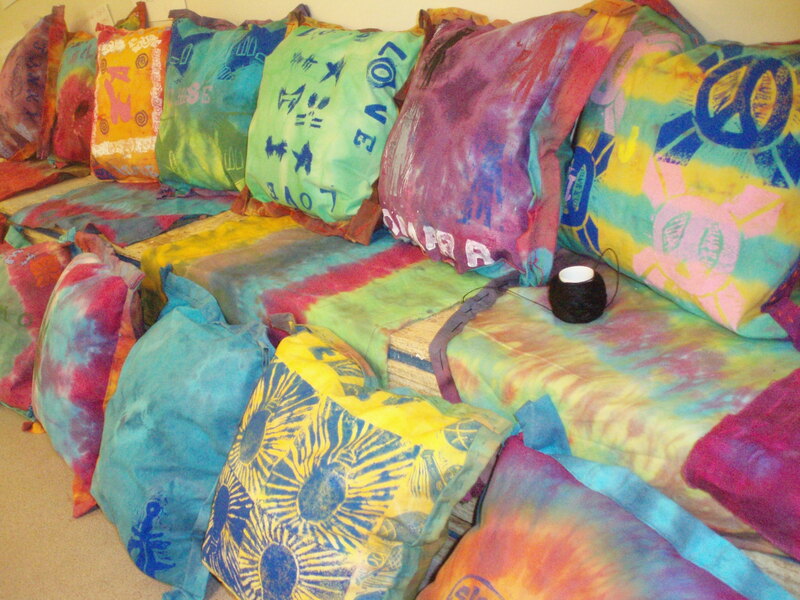 The 7th grade created throw pillows. The final group project consisted of a dozen 8-foot banners displaying various techniques and a mystical-themed appliqué project. Artist residencies do not “take up” valuable classroom time. Artist residencies are the proverbial “stitch in time” that saves nine. Inviting an artist into your school and classroom is an enriching experience for students and teachers. Each will learn a better way of understanding the world around them and exploring the human experience – these two behaviors being the essence of education. The Teaching Art Together grant application is open now with a deadline of Oct. 15, 2013 to develop a residency plan to take place between January and June 2014. STEM stand for Science Technology Engineering and Math – the core subjects in a school curriculum. What moves them forward with the greatest momentum? The Arts – putting the STEAM in STEM. Arts integrated curriculum, a curriculum in any arts discipline or core subject that utilizes the arts to enhance the classroom instruction, is a great way to make learning more accessible. This is even even better when the community gets involved. Kate Sprengnether, the public art manager for the Lexington Legacy Trail, speaks about curating the art pieces for the legacy trail and how Lexington worked together to inspire learning through a community based art project. You may know Pat Ritter, Kentucky Arts Council arts education roster artist, as a muralist and multi-faceted musician and visual artist, but did you know she has a history of bringing science, technology, engineering and math into the classroom utilizing the visual arts? View the video to observe how you can utilize public art, an arts educator and the Cane Run Watershed to open the door for all learners in your classroom and allow them to step into the world of science. How are you utilizing the arts in your classroom? Do the arts play a role in science, technology, engineering and math in your school’s curriculum? How does the community factor into the equation? We would love to hear your thoughts and ideas!